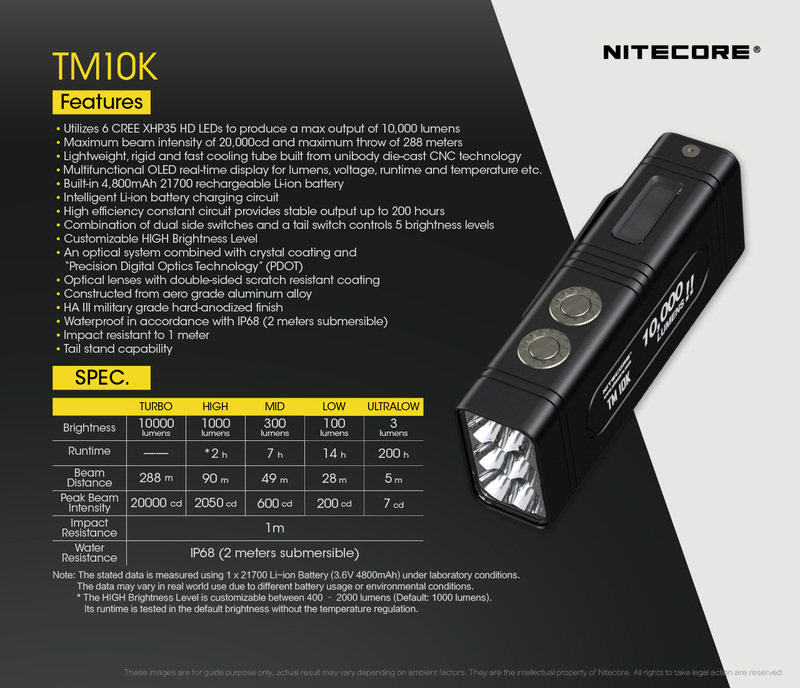 [Review] Nitecore TM10K ... 10,000 lm!! + 3-button UI + QC2.0 USB! At “10,000 Lumens! 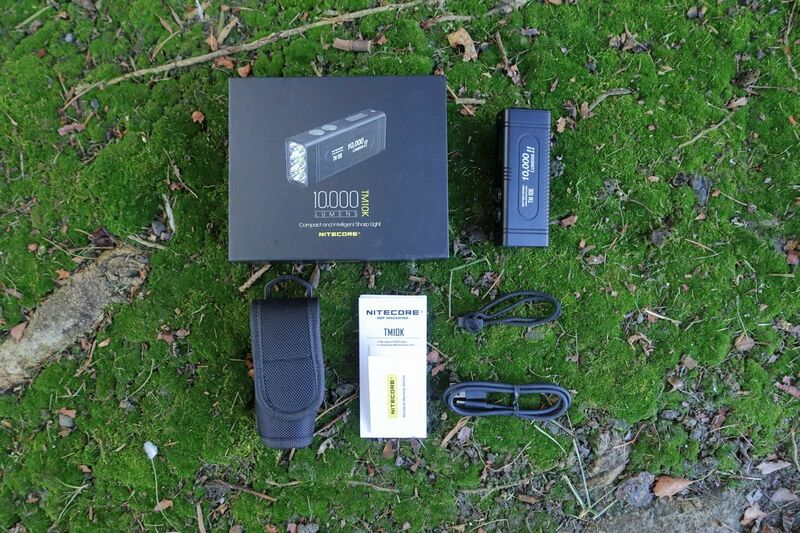 !,” this is Nitecore’s new lumen king and it can totally fit in your pocket! The light has it all, wall of light, small form factor, 3-button UI, user-adjustable HIGH mode, OLED screen, USB QuickCharge2.0, bigger lanyard hole and a built in pocket clip! Some laugh at the 7 second TURBO, and all I can say is that it could of been 3.5 seconds. Overall, the body is very small, has a square cut pattern, and nicely-rounded corners. The body could do with a little more knurling especially on the side with the Nitecore decal. The metal switches are very flush with the body but other design elements help to find the switches. The USB C cover is easy to open but difficult to close up. The front lens seam has a little leftover glue or debris. The light has a built-in battery and I did not attempt to disassemble the light. As stated before, the package comes with a holster, pocket clip, lanyard, USB cable, and a little string? I’m not sure if the string usually comes with it but it may be used for attaching a lanyard. The light uses six XHP35 HD LEDs made by CREE. The light has a 26 degree FWHM beam angle; either way you hold the light. This is the angle at which light output has reached 50% of maximum. With a high-output light like this, 1% of output (100 lumen) is very usable light, therefore you could consider the total spill beam angle to be almost 120 degrees. Currently, these readings are strictly sensor recorded, and are not adjusted based on human perception of light. On Ultra Low, the light actually only lights up the inner 2 leds, pretty cool idea. 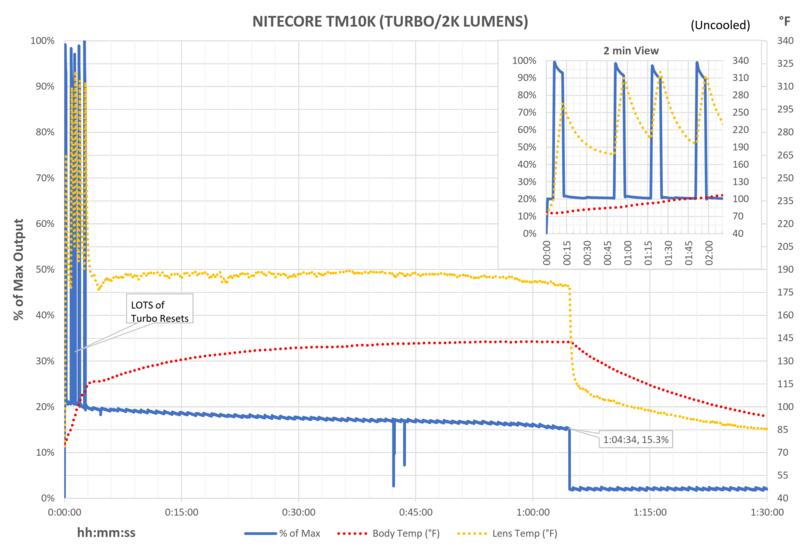 TM10K, like most of the other XHP35 HD lights, has a yellow spot with cooler spill. On the right is a more neutral Nichia 219B in the Nitecore MT06MD penlight. The default spacing is geared towards every-day closer up use, since the HIGH stops at 1,000 lumens by default. Luckily you can set the high from anywhere from 400 lumens up to 2,000 lumens; I would have liked to been able to set the high to 5,000 lumens though. The light has a built-in, non-serviceable, 4,800 mAh battery. Usually the reason for this is for increased performance but also helps reduce the body length. Like the other TMs, this has a built-in OLED screen which provides feedback on the light, including: current mode with lumens, light temperature, battery voltage, battery status icon, charging mode feedback, lock and unlock, and a discharge bar for the TURBO. If the light has gotten too hot, the display will say “Overheat” and you are locked out of TURBO until the light cools. Additionally, there is a blue indicator light on the TURBO button for button finding, and for a drop and find type mode. If memory serves me, I believe this blinks rapidly during overheat and when the battery gets very low. It took me about 2h 30m to fully charge the light which is a bit longer than the 1.5 hours stated in the manual; according to my data, the 1.5 hours is to get to 80% full mark which is kind of what the marketing for QC emphasizes that you get pretty full fast but takes a while to finish it off. For some reason, some of the marketing material on the website says “Approx. 30 min to charge most of battery” but according to my data, 30 min gets to only about 34% full. The light uses USB-C but does not provide a wall adapter which is needed for the QuickCharge function. I used a QC2.0 source and the power supply jumped up to 12V at 1.5A. See table below for the QC2.0 voltage/current combos. I typically verify battery capacity by summing up all the current and converting the time to hours but it appears the light is using a switching circuit to increase the amperage so I can’t directly measure the direct supply to the cell. I summed the watts over time separately and I got about 22Wh and if it’s the same as this cell (https://charger.nitecore.com/product/inr21700) with about 17Wh, than the light has a pretty conservative cell. As advertised the TURBO is limited to 7 seconds which seems mainly for heat management purposes. Since the HIGH mode can be adjusted to 2,000 lumens I ran the light at that level. 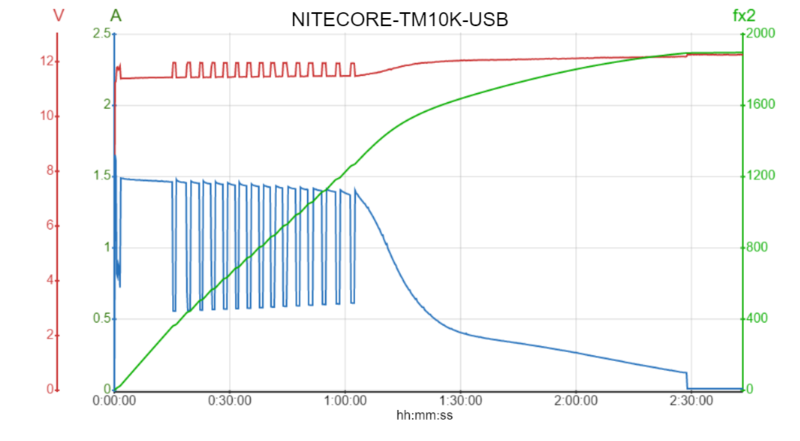 There appears to be no significant PWM on any constant mode.For comparison, the third graph shows PWM varying from 0 to 120 lx on the LOW mode on the Nitecore R25 flashlight. There is no strobe or any special modes. The UI is well done and this 3-button interface I believe is a new one for Nitecore. Very happy to see shortcuts to Ultra Low and to High. It even has the boost UI that allows you to have a momentary TURBO by holding the mode button from ON. There are two electronic lockout modes, Lockout #1 leaves on the TURBO switch, and Lockout #2 locks all switches. I think that the Lockout #1 should be opposite, lock out the TURBO switch, or TURBO mode altogether, and leave on the side switches. A little surprising that there is no strobe or other special modes but this helps open up a lot of options on the UI. There is a little beacon mode initiated from OFF by pressing both POWER and MODE switches together until the screen says BEACON ON, and the TURBO switch indicator will blink blue repeatedly when the light is off, and will persist if the light is turn on and off again. 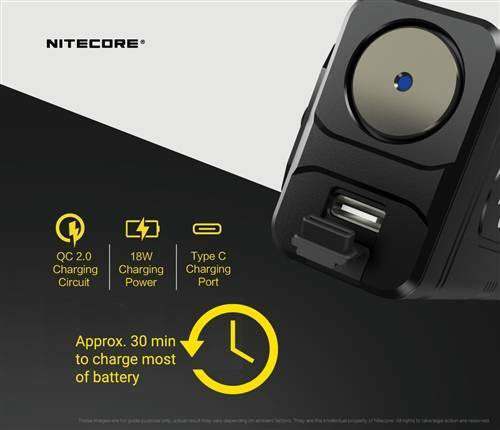 CivilGear Reviews received this product from Nitecore for testing and providing an honest review.